For seven summers I was the cook for The British Columbia Natural History Society. In 1994 I graduated from The Dubruelle French Culinary School in Vancouver, and ran a kitchen at a small residence on the UBC Campus. This left my summers free, and I took on the task of prepping to feed upwards of sixty hikers at elevations upwards to some 3000 m., or approximately 10,000 ft. It involved cooking and then packing vacuum-sealed , frozen meals in large chests with dry ice before joining the caravan of cars towards the mountain destination of choice. Once at the base, everything–including me–was hauled to the summit in a net-outfitted helicopter, and the business of setting up the huge kitchen and dining tents was begun. Frequently it was snowing up top–though only twenty minutes before I’d been roasting in the July heat–leaving me scrambling to find my parka. The challenge was to get everything unboxed and laid out in some semblance of order–while ensuring the burners were properly hooked up to giant propane tanks–so that all-important first meal could be served some three hours later. After that, I could do the washing-up and at least semi-relax by first getting my little tent set up and then getting myself organized enough to be able to do breakfast when I awoke at 4 a.m.
By Day Three (of the ten day experience), it felt like I’d lived there my whole life, and could spend my days doing watercolours while the hikers tramped all over the rugged terrain carrying the bagged lunches they packed for themselves after dinner the night before. Once I’d served their breakfast, they’d stroll about with final cups of coffee making sure I overheard their latest Grizzly Bear spotting stories. Then they’d be off, leaving me sitting there all day minding that food all by myself. Here is a painting from one of those seven summers. And though I can’t be entirely positive, I believe this particular view is from the Eastern British Columbia Mountain Range known simply as The Columbias. And yes, I did see Grizzlies, but only from a distance. how very kind—it’s an honour to have you here and commenting. Lance, thanks for following up this way. I’m just beginning to dig into your site and you have had such a fascinating life. I love the simplicity of Glaciers In the Columbia’s and the shadowed foreground. Thank you once more for your gracious remarks, Jen. Your in the best place to spend summers. I’m so pleased to have you tell me that, Kim. Thank you and welcome home. Lance – what an incredible job! People like you that embrace your time and place and honor it with incredible art, make my heart sing. I appreciate your coming here to comment–and I am still chuckling over your joke entitled ‘Merlot’. Your site has something for everyone. Thank you Ms. Denton very much for taking the time–I am enjoying your bumblebee and butterfly, while looking out at blue skies and bright sun (on the snow). Now THAT isn’t even something I can bring a smile to. Any young boy/teen being chased by something that large would be terrified. Exquisite painting, and very interesting reflection. What a wonderful experience! I had a young black bear chase me once when I was at Boy Scout camp. It was a frightening experience. Luckily, I was close enough to a cabin to sneak in before he caught up to me. YES. thank you, Lloyd for making that clear. Bears are great to watch, as long as it is at a zoo or at a great distance. that is so very kind and sweet of you nia–but you know you are the one who should get this one. you are so welcome and you deserve it..looking forward to seeing your next post! Your experience, though not identical, reminds me of Sperry Chalet in Glacier N.P. You can hike up to it, but it’s a long slog. But the provisions that are kept up there during the relatively brief time that the chalet is open to the pubic have to be hauled up in backpacks. I asked someone about the possibility of a helicopter doing the heavy lifting of supplies, but was told that there wasn’t anywhere for it to land. After I made my way up there I understood what they were talking about. you are very sweet and always thinking of others, and far and away more deserving than I, incidental. thank you for the sentiment. I awarded you a Leibster Blogger Award! Check out my blog for Feb 13, 2012! Congratulations! Pass it on! Ha Ha, Lance. I’ll take the Cavalier From Hell. Bears scare me. You are always very sweet to us, Nia–and I hope you enjoy playing in the snow this weekend! How very kind of you to tell me you enjoy my paintings. I am enjoying your photographs, and the way you can make them into your own paintings. I know you enjoy cooking, for you say: “. . . . I also learned how to cook beyond ordinary dishes”. And it sounds as though your life is dedicated to learning about what the real meaning of it is. I admire you and your determination to go beyond conventional wisdom and find your own pathway to fulfilment and new tomorrows. Sounds like a cool experience! So you are a culinary artist as well? Wonderful. I enjoy seeing your watercolors. Yes, most definitely. In situations such as this–and I suspect your photography as well–creating art is just an excuse for becoming more intimate with nature or the subject at hand. By the time I finished this, I felt I knew this mountain more intimately–I knew its various fissures and glacial deposits, etc. and came away enriched by having spent a few hours with it. Thank you for your insights. I do enjoy your commentary on life. Thank you very much–and I’m telling you, Lisa, your photo entitled “iced rose” brings many feelings to the surface. I love it. No threat of Grizzlies on that particular stretch of mountain! Thank you for responding to this painting, and I just love the ring you made today called ‘Ocean’. Fascinating story… and it is so true… that sometimes the adventure on the way is as exciting and as enjoyable as the art that has been our objective, all along. lovely atmospheric painting and a great way to remember those days! Wow, I love the painting and what a great experience. My bucket list includes a climb of Mt. Everest. Thanks for liking the essay and photos! As for the toothbrush thing, that’s neat. I remember learning to do splatter effects by kinda flicking one brush’s bristles against the handle part of another. First, I want to tell you how much I appreciated your ‘Beauty and Beholder’ essay. And the koi are so great to see caught by your lense in the Maymont Japanese Gardens. It wasn’t snowing when I was painting this. But I wanted that sense of drama, and a dusk time of day, so though painting in mid-morning I replicated the effects by spattering opaque white onto the painting with a toothbrush. I’ve just been to your site and enjoying your description of fishing off the pier in Melbourne! 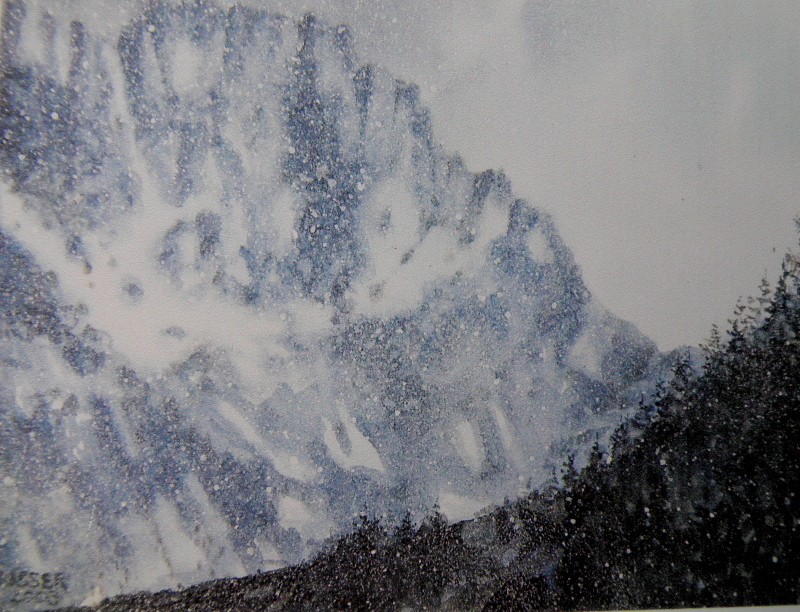 Watercolour painting in nigh impossible when done in weather as depicted in this painting. The painting was done during daylight when quite warm. These occasional flurries weren’t the norm, but they did happen a few times at dawn or dusk which is the time of day I wanted to depict. How the heck did you do the snow like that? I like much. Sounds like you are quite at home in the mountains as well as the kitchen. Does watercolour painting become more difficult when done in cold weather conditions, ie paper becoming too wet? It must be awesome to see bears in the wild. I am very pleased to meet you through your music and gardening site, and I truly hope others who read this will do the same. Thank you for your comments today. Thank you Jane! Not very far from the Rockies, this locale. I keep trying to get a reply off to you, but am hampered by a show jurying deadline. I have to submit something by next week. I love the effect of the falling snow. I can feel the peace and hear the silence of the mountain in this! Love reading the story behind the painting, thanks for sharing! wow. I take my hat off to you, ‘incidental’! They should pin medals on those who go out there to fight forest fires. I look out at a mountain which torched in 2003, and live against a mountain ridge that’s mostly sagebrush and pine. Every summer we cross our fingers. ‘dancing with grizzlies’ coming to a theatre near you. What an amazing experience! Sounds like we both spent a few summers in the woods. I fought forest fires in New Brunswick for the summers of 94 and 95 and had a few bear encounters of my own but not Grizzlies. Sounds like an amazing time and a great gig. Thank you so much for sharing this story which provides just the right perspective from which to view the painting. Are you as artistic with the meals as you are with the paint and paper? I am willing to bet that you are. Oh, and I read an amusing comment about danicng with grizzlies for waffles…I’d love to see the video of that (ha!). Have a great evening and I look forward to seeing your next post! I’m feeling woozy right now just thinking about it. Thank you Erica. I love your photos of the snow-encased tires. People will just have to go to your site to understand. They look so cool. I am certainly not surprised you didn’t draw or paint after doing waitressing all day long–especially serving tourists. We seem to not always be on our best behaviour sometimes when we’re tourists. I’m sure you are really loving being in Norway. Not a bad way to spend your summers! I’m glad you didn’t get too close to grizzlies. What a great experience, that is something completely out of the norm, and to be able to paint as well, that is just great. That sounds like quite an experience for you. and Then to paint the environment you were in while you were there. Thank you so much for sharing. Beautiful painting and wonderful memories. I worked in the Rocky Mountain National Park in Colorado for three summer seasons 95-97… feeding tourist as a waitress. I was inspired by the amazing scenery then, but didn’t take the time to draw or paint it. Your painting makes me wish I did. Thank you for sharing. Your story fills me with envy and your picture very evocative. heh heh–um, yep. Actually, though, at those elevations they have absolutely no idea what ‘people food’ is, and therefore don’t seem attracted to it. If, though, I ever wanted a cartoon bear on this painting, you’d be the one I’d trust to do it. Cool, in more ways than one. Funny how the story adds to a good painting. Makes me want to draw in a cartoon bear on your watercolour. No not really, joke. I bet you had to be careful with your food and leftovers to avoid unwanted visits by the grizzlies. Careless cookery might be hazardous. I’m Boyd and thank you so much! Oh lordy, don’t talk to me about Belgian waffles. I’d dance with a few Grizzlies for a plate of those. I hope everyone goes over to see your portrait of the little Jack Russell, Boyd–or are you Joe? So nice to hear from you–and thank you once more for your graciousness. In retrospect, I’d probably trade having to deal with a bear or two, to putting up with that dog you’re babysitting. Oh, I think I’d like to spend a few in Maine from the looks of your photos, sandy. I would love to hear more about your ‘encounters’, especially now that I’m no where near either (although there was a black bear in our carport some months back). Hearing the story, we feel the absolute remoteness and stillness of the wilderness even more. You set up the painting really well here. And you gave us an interesting snippet of your life along with it! Thanks. What a life! The best summers ever! Beautiful painting with a great sense of place and an awesome atmosphere! Neat to learn more about you. I love to cook myself. I just bought a waffle maker and cooked Belgian waffles this morning and some homemade chilli last night. What a fun way to spend summers! 🙂 Too funny about the Grizzlies. I’ve had encounters with both Grizzlies and Black Bears…awesome creatures.